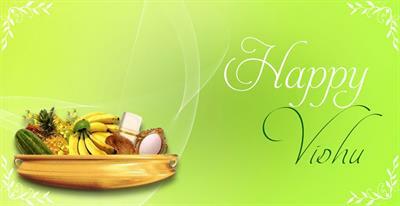 Vishu, being one of the most anticipated religious festival with deliver most amount of joy and pride. We would come across many relevant 'elements' like vishukani, vishusadya, vishukieneetam etc. This auspicious day is considered as a symbol of hope, luck and prosperity. But the most important and worth thing is none other than 'vishukani' which would stay in mind for the whole year. The proceeding which is involved in Vishukani makes the devotee believe that a new bright year is waiting for them which makes Vishu unique. It is also very often for people to hate to see crow or any other undesired things at first sight. Keralites wishes and urges to see the required 'kani' in the vishu day, firstly which would give them strength to work for the whole year. The preparation of Vishu kani is very important in the Vishu celebration. The most important highlights of the festival are Vishu Kani and Vishu Kaineetam. On this day, the eldest member of the family wakes up early morning and lights the traditional lamp. The senior-most member of the family wakes others and takes them to the puja room with their eyes closed. They open their eyes and see the Vishu Kani as their first sight of a fresh new season. Looking at the Vishnu Kani in the early morning of Vishu would bring luck and prosperity for the entire year. The Vishu kani is assembled on a typical vessel named 'Uruli', which is an open mouthed circular vessel made of a special combination of metal. So, as per the tradition, a fresh 'Kasavu Pudava' with golden embroidery will be placed over their Uruli. The Vishu Kani consists of rice, golden cucumber, 'Vettila' (Betel leaves), Pazhukkapakku (Areca nut), golden coloured mango fruit, ripe yellow jackfruit and Konna flowers (Cassia fistula) which usually grow during the period. Coconut, gold, coins, holy books and a mirror (preferably the Aranmula mirror) are placed in the puja room. Meanwhile the traditional lamp is also placed alongside the Vishu Kani. The arrangements are done in the night much prior to Vishu. A well starched clean and neat cloth is taken and pleated like a fan and is inserted into a highly genteel shiny brass 'Kindi'. The Aranmula Valkannadi which has a long thin handle is also inserted into the Kindi and is then placed in the Uruli on top of rice. On a flat bottomed plate a small amount of rice, silver coin and some flowers are kept. After the kanikanal process, the devotee keeps a wish in their mind and takes the coin. They check whether it is head or tail to find whether his dream will come true. The elders also give the youngsters money, a tradition which is called as Vishu Kaineetam. The Kani Uruli is placed in front of the statue or photo of Sree Krishna and Kani Uruli is decorated with 'Konnapoovu'. The yellow light from the Nilavilaku would create a bright environment. Two small deepams are also lighted in which the wicks are made from the starched clothe. The two deepams are kept inside the halves of a split coconut. All of the above arrangements create a perfect environment of devotion. Vishu has another importance in Kerala. It is the day on which the agricultural works of the year is started. 'Chaalu keeruka' is a ritual that is marking the beginning of the agricultural activities. In the paddy field at a selected location a small function will be arranged. An oil lamp will be lit and certain 'pooja' will be held.Then using the instrument 'Kalappa' one or two chaalu (small line digging the paddy field) will be created. That marks the years activity in the paddy field.